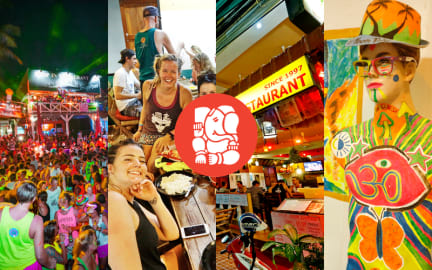 For travelers who want to take in the sights and sounds of Koh Phangan, Om Ganesh Hostel is the perfect choice. From here, guests can enjoy easy access to all that the lively island has to offer. When you book with OmGanesh Hotel every body get on full moon party nigh free bucket and Body Paint! Located in the centre of Haad Rin village just 2 minutes walk from Haad Rin world Famous FullMoon Party and Haadrin beautiful beach. We are ideally situated for your Koh Phangan Experience. O lugar estava sujo, sem papel higienico, quarto com cheiro de mofo, infiltracao.. Lockers estavam arrombados e pouca segurança.. qualquer um entrava. Um dos piores que eu ja estive e eu viajo bastante.